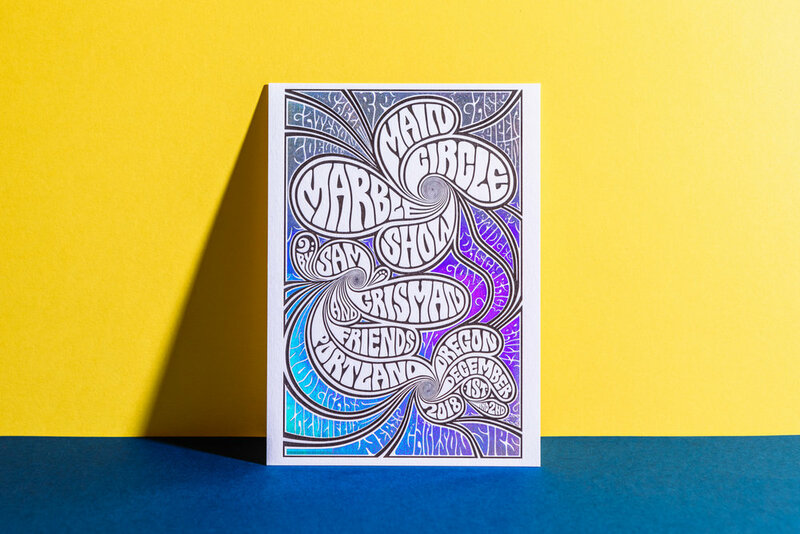 Amazing client-designed postcard for the 2018 Main Circle Marble Show in Portland. Posted in event invitations and tagged with postcard, holographic, foil, black, ice white, colorplan, client designed. April 11, 2019 by Travis Friedrich. This two-sided client-designed save the date postcard combines light warm gray letterpress ink for the front with flat inkjet printing on the back. The botanical image has wonderful ornate detail while the R+B monogram on the back is simple and clean. The two styles work beautifully together. When printing two-sided, we can use letterpress for both, but it's sometimes nice to flat print one of the sides like we've done here. That way the impression from one side doesn't interfere with the impression from the other. Posted in wedding invitations and tagged with save the date, postcard, warm gray, double sided, client designed, inkjet, monogram, pearl white, 300g. March 4, 2015 by Travis Friedrich.